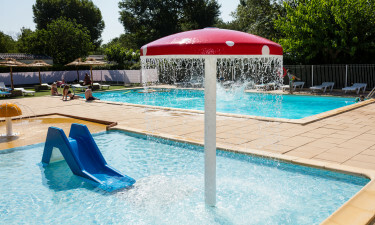 Le Val de Cesse campsite is strategically situated on the grassy banks of a river and encompassed by the magnificent Minervois orchards and vineyards of the lovely, Languedoc region. Nature-loving families will simply adore this delightful hideaway with its peaceful and tranquil environment. To check out availability on your bungalow tent or luxury mobile home, get in touch with a member of staff at LUX-camp today. What stands out about Le Val de Cesse luxury camping? Swimming pool and paddling pool suitable for all. Fitness and wellness centre for adults. Great entertainment including Pétanque competitions. Lots of activities onsite and within surrounding areas. Le Val de Cesse campsite has luxury bungalow and mobile home options to choose from and you won't be disappointed with their entertainment and activities either. The kids will thoroughly enjoy the family-style pool complex and the playground areas, not to mention the fact they can avail of board games, enjoy Pétanque competitions and table tennis. Evening entertainment consists of themed meals plus dance and Karaoke sessions. There's also a full sports programme for keep-fit enthusiasts. For the ultimate in a luxury camping holiday, you can't beat on onsite wellness centre. Le Val de Cesse wants you to relax and unwind and offers a variety of wonderful treatments to ease you into holiday mode. Choose from depilation, facials, full body treatments, massage and manicure. There's also an onsite consultant beautician if you want to arrange other pampering holiday treats and enjoy the ultimate in luxury breaks. 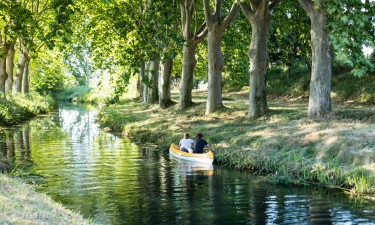 The Canal du Midi is a renowned tourist beauty spot and annually attracts visitors from all over. There are bikes for hire so the family can cycle along the banks, or there are many walking trails too. The canal can be best appreciated by boat or pedal boat, and is also an excellent spot for fishing, diving and kayaking of course. The scenic views which surround the canal make for a lovely retreat and the equestrian centre is well worth a visit as well.